Circumstance explores how secrets kept are more destructive than secrets told. It asks a whole range of questions about how what we believe, what we know, and what we think we know are all influenced by the societies in which we live. It vividly evokes the humid jungle, where ghosts mingle with the living, and magic is an accepted part of daily life. 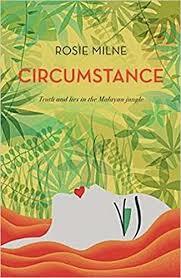 Details: Circumstance is published by Monsoon Books, in paperback, priced in local currencies. The eBook is coming soon.